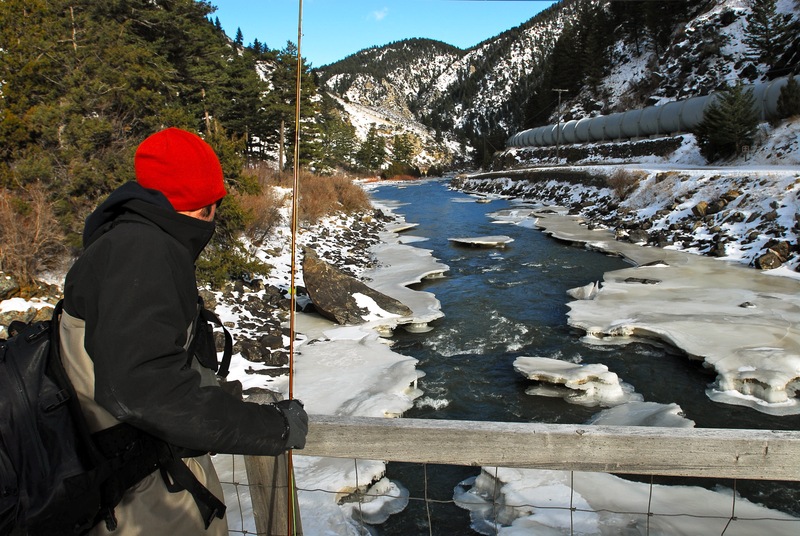 This is some near-frozen trout water in Montana that, while daunting, didn’t inspire us to stay inside. I’ve been thinking a great deal lately about my heroes, about struggles they went through, and what defined them. I’m not just talking about those men (and women) who’ve reached a status of biblical proportions, like Hemingway, Frost and and Kipling, I’m talking about heroes in my own life. Joe Cermele is an editor at Field & Stream who befriended and inspired me when I was an intern there fresh out of Syracuse University. Chris Megan at On The Water gave me my first job as a copy editor after that Internship and when I decided to take my first big shot… fishing the entire country, Gerry Bethge of Outdoor Life saw to it that that adventure had legs. Todd Smith at Outdoor Sportsman Group got on board when I decided to fight Melanoma and brought the full weight of all his years of experience in this industry to my aid. Joe Higgins at Tomo’s Tackle has been of great help to me since I moved to the North Shore. And of course there’s my father, who you’ve heard more than enough about already. And if you get to know any “hero,” you’ll see that they, in their own lives, overcame great struggle and hardship before they even had a chance to become what they are today. And if we’re fortunate, as I was, we come into this life with support and inspiration from our families and friends. But if we have enough courage, we reach a breaking point where the world hands us our first great hardship. I was blessed to have work in the industry I loved, parental support and friendship. The work, which was a river, has ebbed to stream, although it’s not yet dry. I’ve made new friends here in Boston, but I’ve lost some too, and yes that’s hard to write. And I am no more fit to site here and describe to you the measure of a man than is anyone who has survived 30 years on this planet. But I can tell you what I’m beginning to believe it might be. I believe it is, after we use what gifts we are given to begin with, how we respond to hardship, how we win friendships back that are worth fighting for, how we decide what to stand for and how we make that stand. When you go through something difficult, whether that’s losing a job, a loved one, a vehicle in an accident, a parent or your health… or all five almost once as I did, there’s the tendency to think that your struggles are unique in their severity because it’s inherently true that you feel them to a greater degree than you might anyone else’s. But a close examination of any life will show its share of hardship, and many lives are burdened with far more than their share. And it seems to me, now, although I haven’t drawn any conclusions that most can’t given enough time, that the measure of a man isn’t anything he has intrinsically at birth, but rather how he responds to those hardships dealt him, how he gets back up after falling and what he learns in the process. We all, given enough time an opportunity, will fall. That much is almost guaranteed us at birth. I am coming to believe that it’s the getting back up that matters. I am coming to believe that it’s not some spectacular first effort that defines us, but rather the second and the third and so forth. I am coming to believe that whatever well of resolve and determination we dip into for more of whatever we’re given to begin with… that the contents therein are the measure of a man. And my faith in this ideology is strengthened because it is hard to reach for that, and then for more of it. And I believe that anything worth doing is necessarily difficult. I won’t pretend to know what the measure of a man is, all I can do is share with you what I’ve discovered and hold to be true, for today anyway. And perhaps most importantly, what I can and need to do, is to keep my ears, my mind and my heart open to continue to develop and improve this understanding, and in so doing improve my own understanding of myself and my purpose here. I have mentioned and shared the work of those who have been so influential in my life because to understand yourself, you first must understand that it’s not about yourself. If it is, that’s all it will ever be about, which seems to me the greatest of all types of sadness: isolation. We should be about… we should strive to be about… the only thing that can give our existence here definition: one another.